Click through for a chat with the fine gentleman behind Brian's Thoughts About Airplanes. His name is Brian. Like me, Brian has struggled to understand Twitter. Anyway, I Tumblred our convo about it, and now I'm blogging the Tumblr link. Of course I'm also going to Twitter this blog post, so make sure you are following me. META COOL!!! Happy new year. SUPER META FOR 2009!!!!! Marshawn Lynch hosted a contest on his Yardbarker blog asking kids to demonstrate their BEAST MODE. There were a lot of cute entries, but my favorite was from Tony, one of the winners Marshawn named today. Fifteen years from now this kid will have his own Nike commercial, mark my words. Beast Mode brought to you by AAAAHHHHHHHHH! 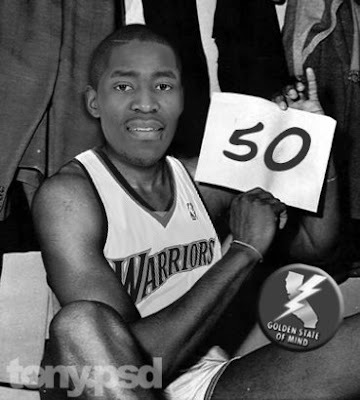 'Mal matched his career high of 50 to get the Warriors their first win in a hot minute. Much love to my boys Tony PSD and Atma Brother #1 for the picture, from GSOM. The Real Natalie Gulbis and Joe Rogan Are on Twitter Too! It's ok Joe, we're ALL dumbstruck by her beauty. First I told you about Twitter pulling The Real Shaq, now it's golf hottie Natalie Gulbis. Yes, I confirmed that it's really her! Comedian, UFC commentator, and brand new Yardbarker blogger Joe Rogan is also on Twitter (joerogandotnet... that's gonna be a hard one to verbalize at your shows, homie). I still have no idea what I'm doing Twitter-wise, but big thanks to my ace Matt Watson for trying to teach me. I mean... @mattwatson THANKS! You can follow me at alana_g... but keep your expectations low. From the good folks who tipped me off to Shaq's Twitter feed comes the latest in sports-new-media-madness: a virtual 82nd birthday party for JoePa! I'm not sure exactly how it's going to work... (virtual cake?)... and the blog mentions that the party is a surprise (no such thing on the internet!). But there is a cool post called Top 82 Reasons We Love JoePa which is continuously being updated with new submissions from fans. Right now it's filled with sincere messages. 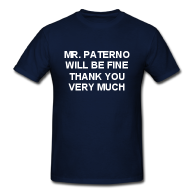 But I know the blogosphere has its own reasons for loving JoePa! Somebody please submit something and see if they'll have a sense of humor about it -- if they're letting Shaq loose on Twitter, you have to think they will. *Yes, I just coined that word. Ep. 359: Hello And Goodbye from The Basketball Jones brought to you by the number 76. Tas was lamenting that his nickname for Greg Oden, G-OD, had never caught on. Skeets rightfully pointed out that when I had asked Greg about it in my old Greg Oden / Miss Gossip interview, Greg had HATED it. Tas then rightfully pointed out that the proper pronunciation of my name is not 'Alannah G,' but 'Alana G.' Touché. By the way, the video of that Oden interview, along with several dozen of my other original videos, will cease to exist on December 18th. Thanks, AOL! The new campaign centers around an Amazing Tour Bus. Apparently people get shrunken down (like this?) 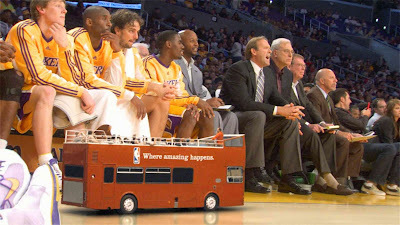 to ride in a miniature tour bus which spies on NBA stars during moments fans rarely get to see. 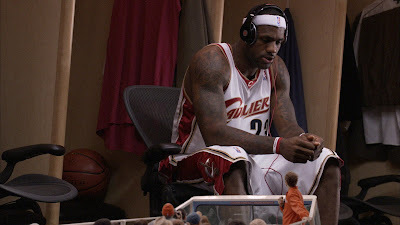 One of the spots features LeBron during his pre-game ritual of singing along to the music in his headphones. What's he singing? No, it's not the latest Kanye or Fitty or whatever the kids are listening to these days. It's the old Cyndi Lauper hit, Time After Time. * Oh LeBron! You can watch outtakes of LeBron singing here. (Don't quit your day job, homie.) I can't show you video of the other spots yet, but I can tell you they involve mystery, intrigue, Greg Oden's gigantic feet, and Pau Gasol's sweaty pants. Last year's Amazing campaign was pretty well received, and I think this one will be too -- it was done by the same ad agency (Goodby Silverstein) and the spots were apparently directed by Randy Krallman, the guy who does those funny talking baby E-Trade commercials ("hey girl, can I hit you back?"). We'll see how they go over when they air December 25th during the five games on ESPN, ABC, and TNT. But let's be real, we don't really care how they go over with the general public. The real question is, will the blogosphere step up its parody game this year? Come on folks, I'm trying to see a mini bus roll through to see Eddy Curry eating dinner or Allen Iverson worshipping in his shrine to Michael Jackson or Sheed gardening in his [cough cough] backyard. Consider that a CHALLENNNNGE blogosphere! *Ok, can we please pause to appreciate how effed up the video for "Time After Time" is? I remember watching it when I was a youngun but the only thing that struck me as weird at that time was that Cyndi's hair looked like she had slept on a waffle iron. I guess all music videos from the eighties were kind of messed up. Someone call those literal guys and tell them to work on this one next. Booo. Now I have to revise my Boris Diaw stalking schedule. 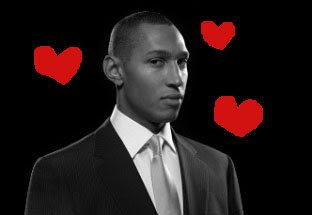 If you don't know about my relationship with Boom Boom, see: Stalking Boris Diaw #1, Stalking Boris Diaw #2, Stalking Boris Diaw #3, Stalking Boris Diaw #4. Or simply Google Stalking Boris Diaw. LeBron James jumped off the wall in the middle of the night and stuck his body onto himself. True story. Rasheed Wallace is back! And you thought we were done with him... 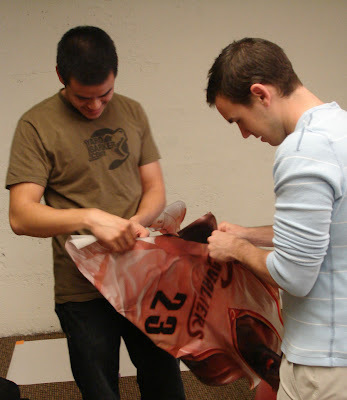 In his latest Yardbarker blog post, he introduces a contest. You'll have to watch the video for details, but I can tell you that the prize is SPECTACULAR. Also, Sheed says on his blog that the most "creative" answer wins, so ummm good luck with that one!! Sheedtasicity brought to you by barren hotel rooms everywhere.